Kirby Street Police Station from 1849 OS map with a central cell and one more to rear indicated. 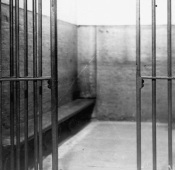 Feb 19th 1857 Cells that were defectively constructed dark and ill ventilated would require only a small outlay to make them good cells. Plans drawn for their reconstruction approved at £235. Dec 3rd 1857 Sgt now required. 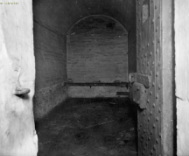 April 12th 1860 Heating apparatus in the cells has been very unsatisfactory and on the last few days had to discontinue its usage. Sept 21st 1867 Rents and charges for cottages in the force Cottage coals and gas 4/- Lodgings for single men 1/-. Oct 17th 1867 Following the death of Sgt Brett in the ‘Fenian Outrage’ the LUSC ordered to make arrangements to secure the stations by:- Plating the doors in iron, wrought iron bars to windows, raise the walls 4’. 29 Sept 1977 HMIC Inspection report: Lock-up in Kirby Street is defective in ventilation. Feb 18th 1886 Tender to repair roof slates and timbers. Nov 24th 1887 Resolved station unfit for police purposes and desirable a new station be erected in the neighbourhood. City surveyor to pursue. July 7th 1888 To take properties at 103-111 Canal Street and 1-9 Horne St New Islington for new station in lieu of Kirby St.
Jan 23rd 1890 Cannel St now occupied in lieu of Kirby St.
May 15th 1890 Valuation: practically of no value as PS £357 for land only. Station closed. July 23rd 1891 Twinquennial valuation of properties owned by the W.C only: £357. Dec 12th 1891 Sale of the building materials. 26th July 1894 The [cleared] site to be now advertised for sale. 22nd Oct 1896 Sale of the site referred to the LUSC. 13th May 1897 Sale of the site for £271 to Mr Beresford coal dealer. 2012 Street now demolished and central to the New Islington development. View over towards Cardroom Rd new houses on the site of Kirby St Police Station. 1890s Cannel St in background on the left now called Winder Drive.